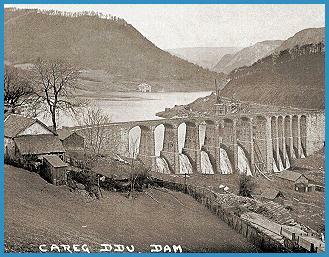 The dams, reservoirs, and 73 mile aqueduct of the ElanValley waterworks in mid-Wales were built a hundred years ago to supply desperately needed clean water to the city of Birmingham in the English midlands. It was an epic feat of civil engineering, and the remarkable story of the Elan Valley dams includes the poet Shelley and the Dambusters of the Second World War. Use the links below to pages on many aspects of the story of the dams.